Patrick McKee has been hired by the OEP to serve as UConn’s Sustainability Program Manager. Patrick brings with him six years of experience in the sustainability field in both the private and public sectors. 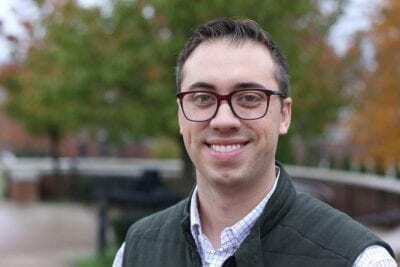 Most recently, his three years as the first Sustainability Manager at Eastern Kentucky University resulted in the establishment of a dock-less bike share program, improvements to both recycling and energy management, and the integration of sustainability thinking into university decision making. During this time he advised up to six student employees per semester, several of whom were also students in the ENV200: The Global Sustainable Future course that he instructed as an adjunct faculty member. Prior to working at Eastern Kentucky University, Patrick served as a Sustainability Analyst with Legrand, North America at its West Hartford headquarters. While at Legrand, he helped spearhead operations and social sustainability initiatives including a highly successful energy savings competition known as the “Legrand Energy Marathon” and the ”Better Communities” corporate volunteer program. Patrick has obtained a bachelor of science degree in biology from Mount Aloysius College in Cresson, PA, and received his master of science degree in environmental science and management from Duquesne University in Pittsburgh, PA.
Patrick will work under the supervision of Rich Miller, OEP Director and will supervise the OEP’s high-achieving intern staff. He is looking forward to the work ahead. “This is a new challenge for me. I’m excited for this opportunity to become a leader at a large university that is already one of the top performers in sustainability. The many available resources and embracing culture at UConn will allow me to take the program to new heights.” said McKee. Please welcome Patrick to campus by emailing him at patrick.mckee@uconn.edu.